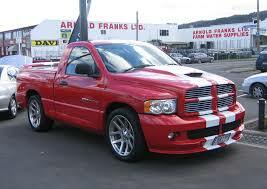 The Dodge Ram truck line was initially introduced in 1981, and is now on it’s fourth generation. Major engine improvements became standard in 1988, with the old slant-six engine replaced by a new V-6 offering more power. The standard time-honored 318 cubic-inch V-8 was given a fuel-injection upgrade. A turbo-charged Cummings six-cylinder in-line diesel engine featuring direct fuel injection was introduced that year, helping boost Ram sales. Engine upgrades for 1992-93 2500 and 3500 models included multi-port fuel injection and higher compression cylinder heads. This extra power option was designated Magnum. In 1994 a sleek new re-design inspired by big rigs was offered, which quickly became popular. In 1998 a new dashboard, dual airbags plus upgraded interior became standard, as was the QuadCab model with small rear doors. Sales reached over 400 thousand in 1999, at about the time that a new eight-liter V-10 engine was offered on the 2500 and higher models for extra towing power. The all-new third generation Ram 1500 appeared in 2002, with higher models getting the new style a year later. This significant upgrade covered the drivetrain and suspension as well. Sales reached a new record of about 450,000. A larger Cummins diesel engine became available in 2005, while a new hemi-V8 arrived in 2006 that featured cylinder-deactivating capability for increased fuel economy. The latest generation became available in 2009, the same year that Ram Trucks became a separate brand. A real Crew Cab model featuring four doors was offered, as well as a heavy-duty 3500. The 1500 got minor exterior upgrades in 2013. Initially production began at Warren Michigan, where most models have been built up to 2014. The Ram 1500 truck model have also been built at the Saltillo assembly plant in Mexico. Ram 1500 production in Fenton Missouri shut down in 2009. Ram trucks are now the only ones available with a manual transmission, since competing makes have gone entirely to automatic transmissions.